Jane Dundas, Kathryn Hamilton, Nonie Jekabsons and Moss Johnson. TOWN of Bassendean’s special meeting of electors has been deferred to next Wednesday at a bigger venue after more than 200 residents flooded council chambers on Tuesday night. There were about 98 residents seated inside and 120 outside the chambers to discuss the development proposals for Bassendean Oval, BIC Reserve and the Wilson Street carpark. Mayor John Gangell moved a motion to shift the meeting to a later date because of inadequate space within the chambers and the unavailability of the larger community hall located below the chambers. Councillor Gangell said the community hall could accommodate 200 people and was available on September 7. “The Town will also do its best to advertise the rescheduled special meeting of electors,” he said. Residents agreed to the rescheduled date. 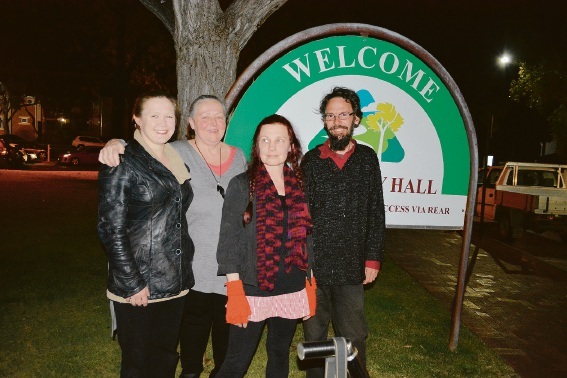 Petitioner and Bassendean resident Kathryn Hamilton said residents tried to change locations before the meeting. “We had booked St Mark’s hall when we knew (numbers) was a problem a week ago,” she said. Ms Hamilton said she and other residents started another petition to State Government on Sunday, in a bid to stop the development from going ahead. The rescheduled special meeting of electors will be held at the Town of Bassendean community hall on Wednesday, September 7 at 7pm.